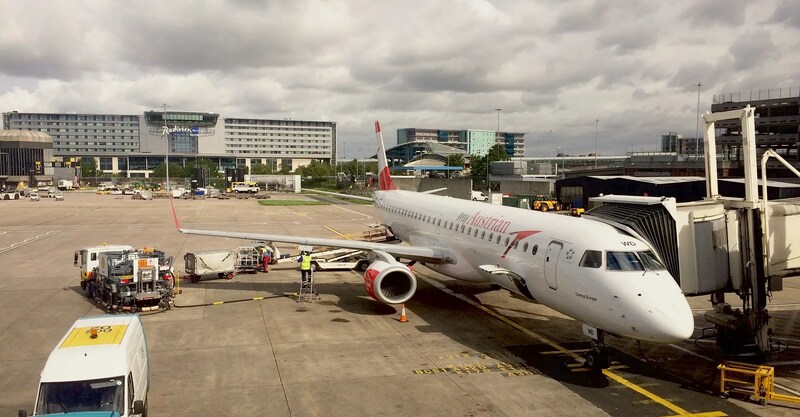 I had the Friday off and I flew Austrian Airlines for the first time ever. Like the Finnair flights I took to Helsinki for my previous Japan trips, it was an Embraer 195 jet but Austrian had way better livery and we actually had proper drinks and snacks. The flight was fantastically smooth and Vienna was sunny as we touched down in Schwechat. Cleared immigration and (the non-existent) customs in less than 20 minutes and I was on the CAT to Wien Mitte, which took about 15 minutes. I took to a bit of sight-seeing on Friday evening, after checking into my hotel on Schottenring, and Saturday morning. It rained on Saturday morning, and after a lovely breakfast downstairs, I spammed the band’s main and personal Twitter accounts requesting that they would play Rainy tonight. My nihon go was all over the place, but the emoji should help. Hehe. To tell you the truth, I met up with Ikimaru on late Saturday morning hoping to catch the lasses in the city, following his awesome luck *KOFF* of stumbling *KOFF* into them in Köln. I gambled upon waiting at MuseumsQuartier after a quick sushi lunch, as there were the twin art/natural history museums on Maria-Theresien-Platz and the more modern counterpart across the road which had museum shops and cafés that may take RINA’s fancy (they did Museumplein in Amsterdam the day after the melkweg gig). However, come 2PM we gave up and took the U-bahn to the venue in Simmering. The queue was short when we got there at about half two. Despite the toilet-like stench (it was the side of a club), we patiently wait for the doors to open at six. There were a few things which made the wait bearable. Firstly, hanging out with like-minded SCANDAL fans from all around Europe. Next, the tour bus was parked slap bang in front of us. So, when MAMI came out from the bus, we could just exchange a *KOFF KOFF* casual こんにちは, and then TIMO would pop out from backstage to get into the bus, it was just another casual hel…*KOFF* what? WHAT?! And another thing – we could hear the soundcheck loud and clear. And they played a certain song I tweeted about to them seven hours earlier. Like Amsterdam, we only got to get in about 20 minutes later than the stipulated time. By this time, the queue had indeed got longer but there were also people who came later than us but were in front of us. Ikimaru suggested we stick close to the French fans who were making their way closer to the door. Luckily for us, we got in unimpeded by the latecomers and I was virtually third in line for the high-five sesh. This was the best meet-and-greet sesh with the band thus far. The b7klan people told us to not rush and I wasn’t complaining. I had gifts for each of them this time, including one postcard-sized piece of artwork from a friend/SHCB-mate from Bandung as well as a picture-message from the SHCB lot that covered LOVE which caught TIMO’s attention the week before when we put the video out on YouTube. I told HARU that I included a list of three fish and chips eateries that the band could choose from when they are in London the following weekend. MAMI was ecstatic with the B&W photo of her onstage at melkweg, and as I didn’t want to hold up the queue, I told her to check out the artwork that my friend made especially for her. 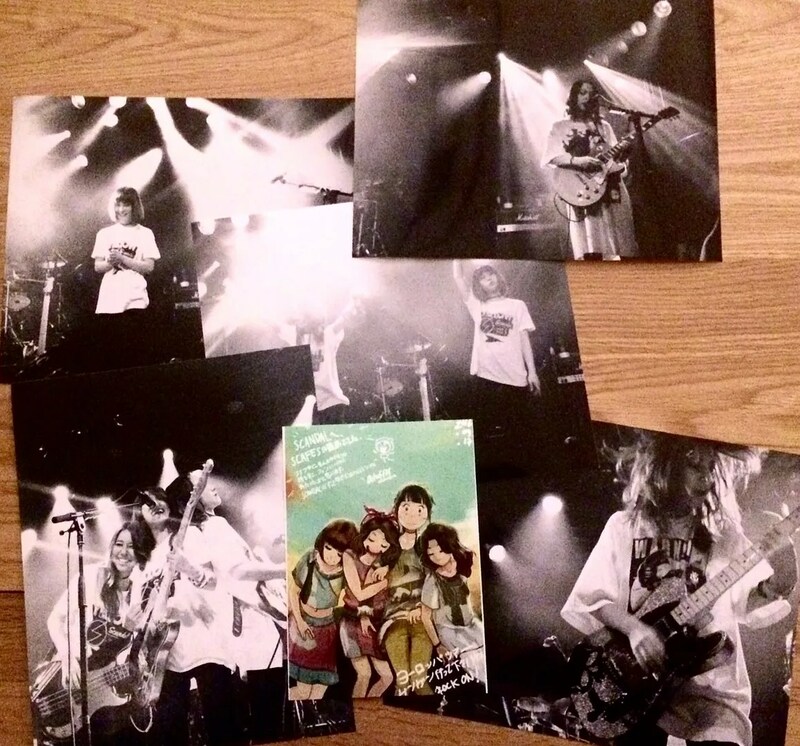 TIMO was looking at the photo and from their exclamations of 「わぁぁー」, it appeared that they recognise her work. It was TIMO next, and as she had seen I was giving them photos of them in Amsterdam, I asked if she remembered the LOVE cover and she said yes as did RINA who was taking an interest in the photo and fan letter I had. I explained to her this was a little fan letter (with pictures) from some of the cover band members to SCANDAL. 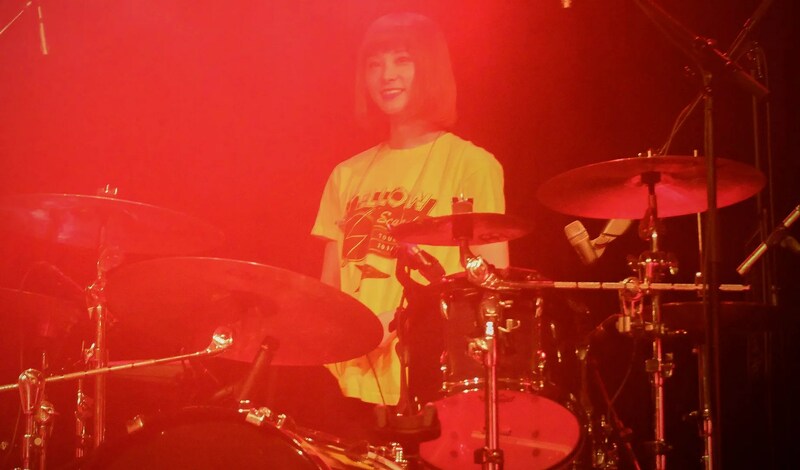 I gave two photos to RINA as it was very difficult to capture her behind the kit satsfactorily in Amsterdam. I complimented on her drumming again, gently high-fived her and walked away a happy fan. The hall was probably a tad smaller than the O2 in Islington but was defo bigger than melkweg. I planted myself slap bang in the front row between HARU and MAMI’s spots onstage. At long last – it took nine shows before this achievement was finally unlocked for me. 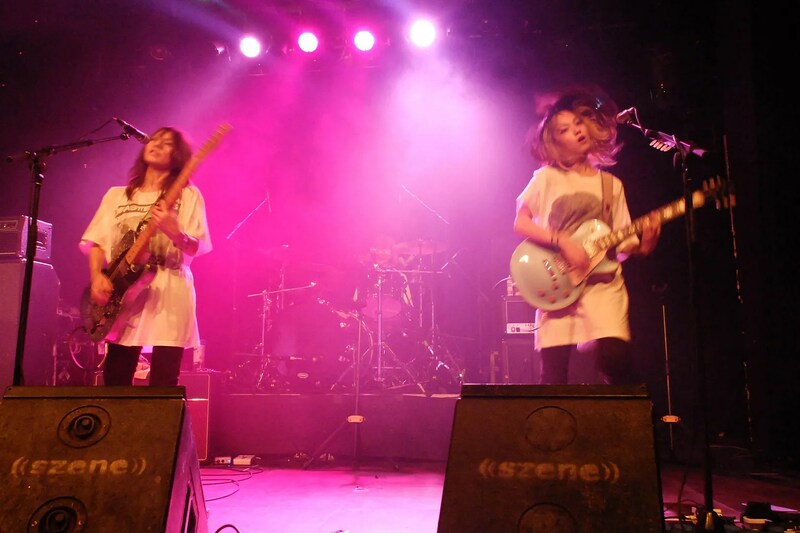 Like Amsterdam, SCANDAL came onstage in large white tees and skinny black jeans to Beastie Boys’ Ch-check It Out blaring on the house PA and kicked off their set with the YELLOW instrumental rocker, Room n°7. 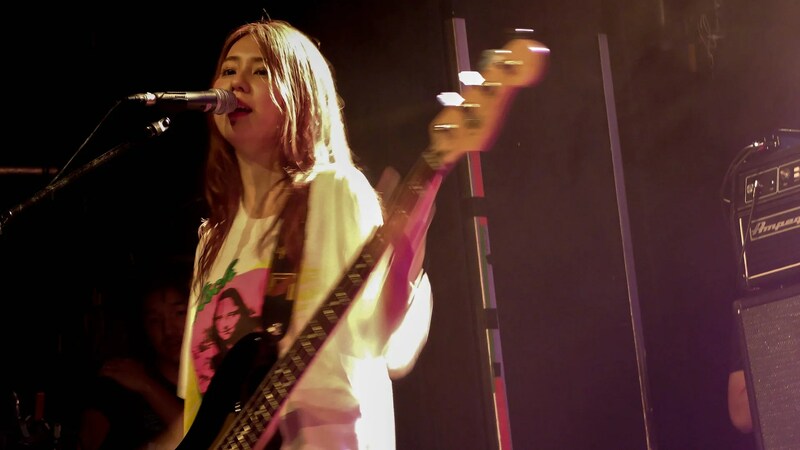 Interestingly, HARU had a Beastie Boys’ Check Your Head tee on that night! I wasn’t under the illusion that tonight’s set was to be any different from that of Amsterdam’s the week before. 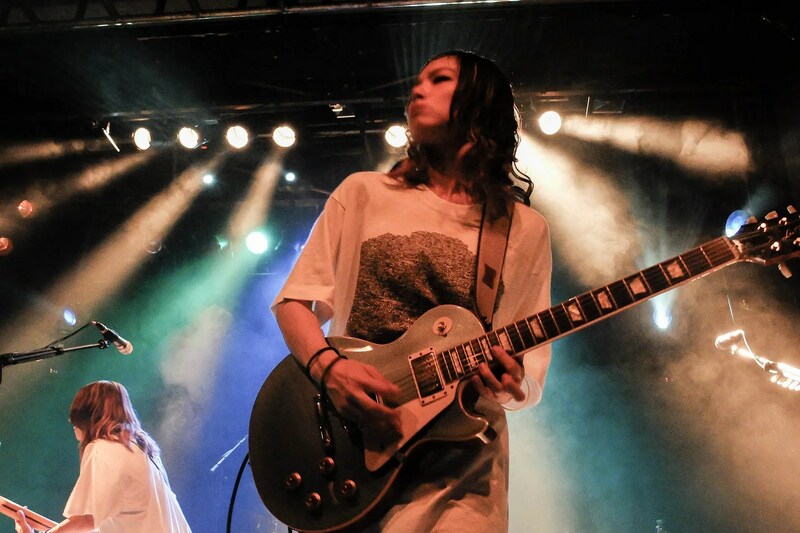 Especially when in the week prior to this evening, I finally checked out a photo of the set list in Amsterdam where it stated that the encore had an alternative song to 少女S, and that they did in Köln. Also, I’ve heard of an alternative set which was played the night before in Wrocław. By the time they rolled Stamp! and Your song out, I wasn’t being too hopeful. Then it was MAMI’s opening riff to Rainy. At that very moment, I was in seventh heaven. It might be a response to my tweets, or it may well be what they do every time it rained – but I didn’t care, as I really wanted to hear/see this performed live right in front of my very eyes. To tell you the truth, what we had as rain that morning felt more like a drizzle. Oh, well. 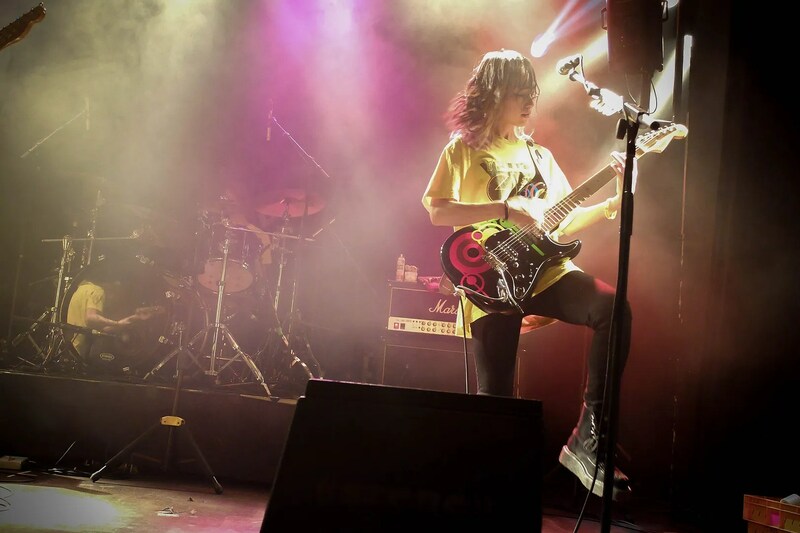 HARU greeted the audience in German in the first MC and returned to the set with LOVE ME DO and the string of YELLOW tunes which I felt could have been changed with other YELLOW songs that weren’t played like ヘブンな気分 or LOVE. I guess it’s the argument for being fair to all the fans in the other cities, I guess. The venue was somewhat hot and I meant that literally. 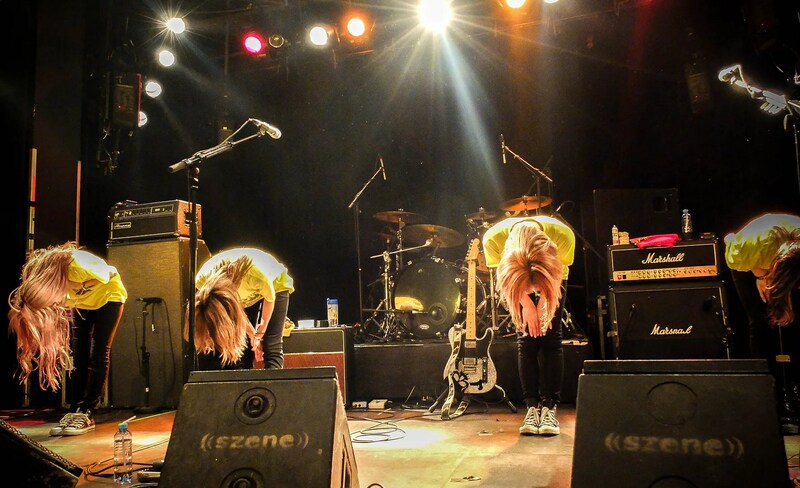 I could see how sweaty the girls in the band were by the time they played Your song. Someone behind me then threw the Austrian flag onstage at the MC after Sisters. I think at this point HARU praised the audience on their Japanese after looking at the penned messages on the flag. HARU commented on how hot it was and went on saying a few more prepared phrases in German to which I had no idea what she was on about. 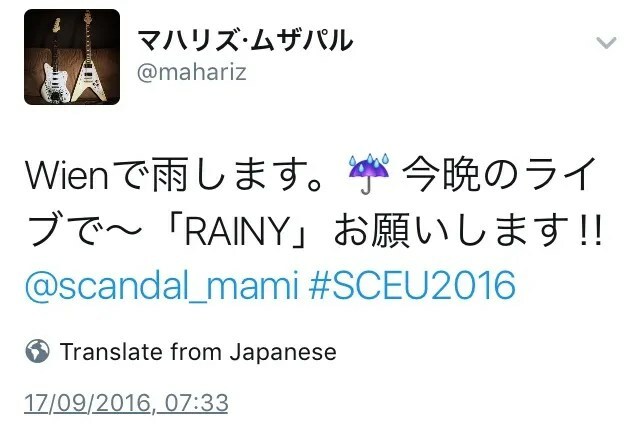 I remembered one of the members of the audience shouted 「とても上手！」 which meant “Pretty good”, in response to HARU’s German. テイクミーアウト was a right treat as per usual, and MAMI seemed a bit more energetic tonight. There was no fumbling on 会わない even. Good on her, the missus! 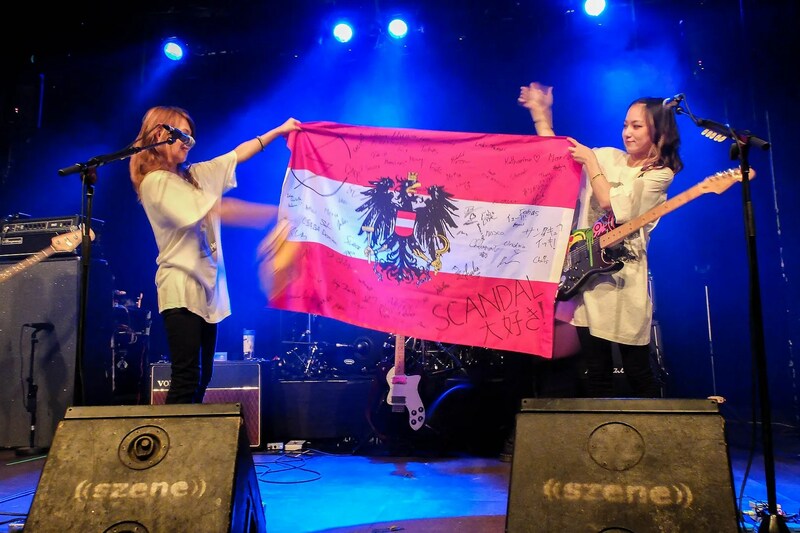 At their MC (after 会わない, I think), HARU told everyone that they couldn’t visit Vienna as much as they’d like to due to their very tight schedule, having just arrived from Poland just this morning. That would explain why our gamble of waiting in the city failed utterly. 少女S was played next which, for me, was a right pleasant surprise. This would be where they played LOVE SURVIVE in Amsterdam, and I was hopeful for that alternative encore for this night. The intensity they showed the weekend was still there, churning out one rocker after another without fail. And this was the crazy three-city weekend (Wrocław-Vienna-Milan) which had no day offs in between. I think they deserve more than pats on their backs for working this hard on the road. They ended their main set with the beautiful ちいさなほのお as per usual. The crowd was cheering on whilst the band got ready to return onstage for the encore. 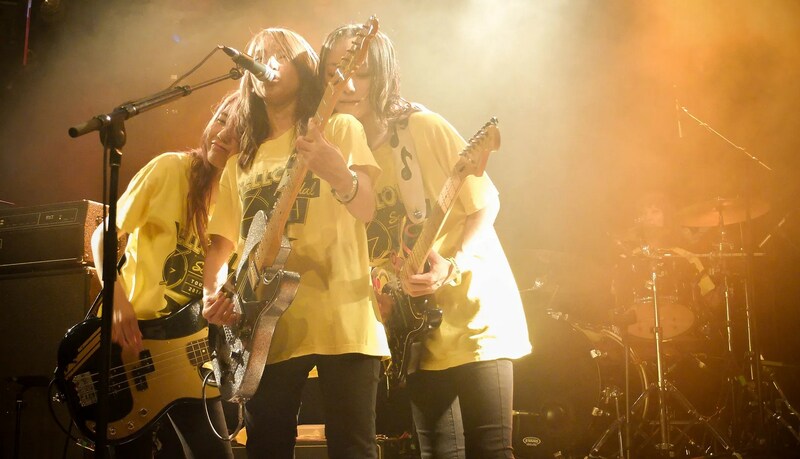 SCANDAL came back onstage, again in the YELLOW tees and did the jam sesh. I couldn’t make out if there were any improvisations made during 「セッション」for their individual solos – I’d prolly find some time to check this out on YouTube. And yes, they played 瞬間センチメンタル on this encore. I was happy because the set in Vienna wasn’t just a minute variation of Amsterdam’s which made the effort to travel all the way to this city worthwhile. Rocked they did, and it was time to finish the set with the obligatory SCANDAL BABY. The jokey bits TIMO and MAMI did on HARU was still about the same as the one in Amsterdam I thought, but it was funny nonetheless, ending the show on a high. 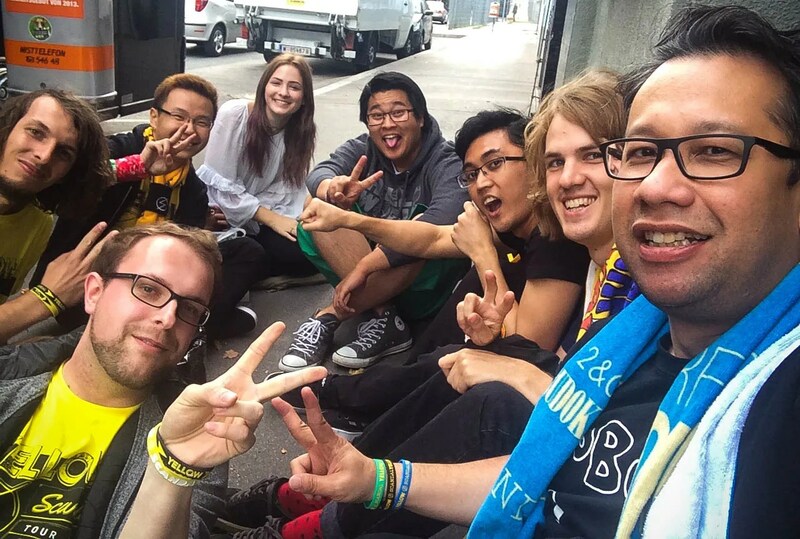 I bought some merch for some friends back in Malaysia and then we hung out near the tour bus waiting for SCANDAL to come out. 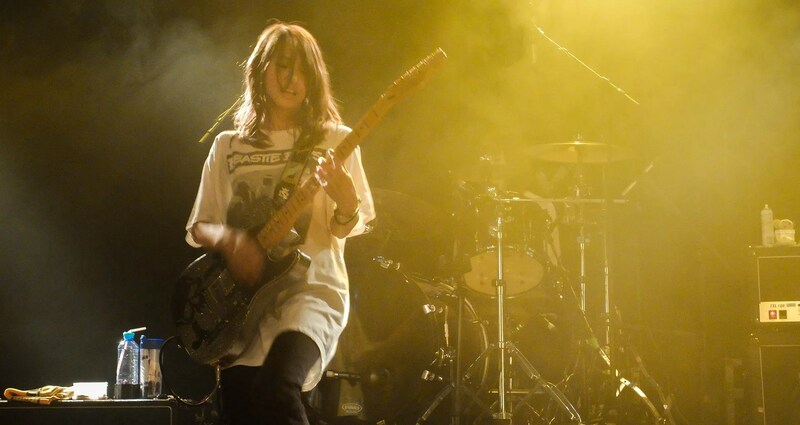 In the meantime, managed to have a quick chat with Nakajima Shin-san, the official band photog. Seems that he is a Nikon man. Also had a chat with the lady who interviewed me in Amsterdam last week. 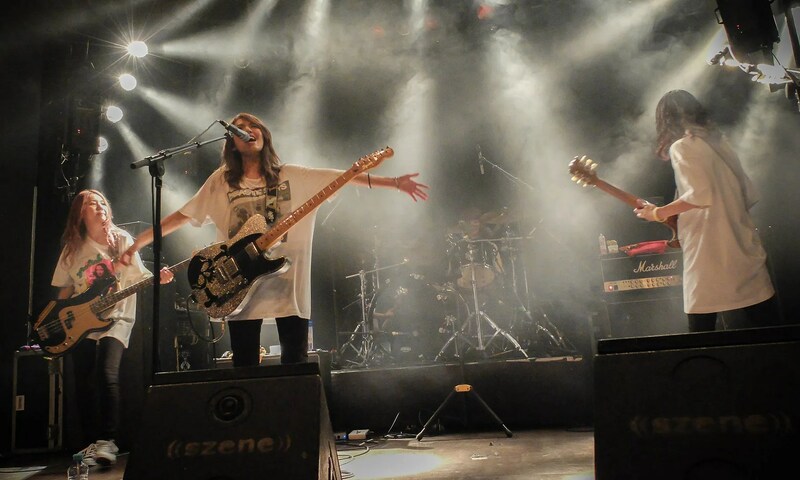 She was surprised that I actually once saw SCANDAL in Maebashi, which is a place that one don’t usually choose to go to watch a band especially when travelling from abroad. The lasses came out and the fans did an impromptu na-na-na acapella from さよならMy Friend. RINA (and MAMI, I think) video-ed this bit of us singing, and RINA did a wefie video with us (I was exactly next to her at this point) before we all said our final goodbyes as they were whisked off in two separate cars. As for the front row crew? We went to a nearby bar, during which time hoping that RINA would put that na-na-na video on her Instagram, and then called it a night. Next and final show of #SCEU2016 for me – London! Flickr set of the gig here. We learnt later the band didn’t get to venture into Vienna. They couldn’t eat fish and chips in 2015, because they didn’t stumble into a shop. The band had re-posted one of her fan art on their official Instagram site. Whilst the short fan letter was for the whole band, I gave it to TIMO as she wrote LOVE. 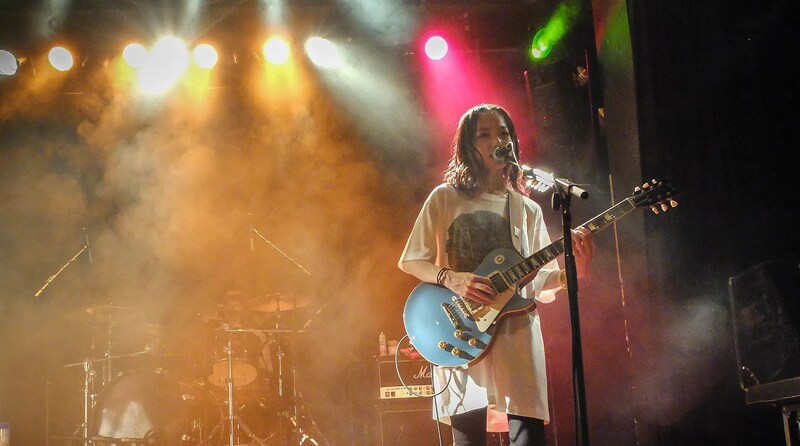 This gig review was originally published in 無秩序の胃 on 18.9.2016.